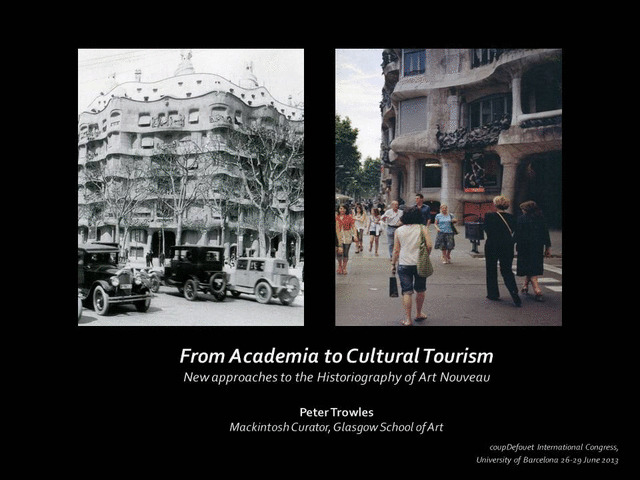 Trowles, Peter (2013) From Academia to Cultural Tourism: New approaches to the historiography of art nouveau. In: coupDefouet International Congress, 26-29 June 2013, University of Barcelona. Writing in 1960, Nikolas Pevsner, the German-born British art and architectural historian and author of ‘Pioneers of the Modern Movement: William Morris to Walter Gropius’ stated: “It is gratifying to see that a subject [Art Nouveau] which, when I first tackled it, in 1936, was shunned by serious scholars has now become the happy hunting ground for American and German and indeed some English students busy on theses, dissertations or otherwise”. That ‘happy hunting ground’ has more or less continued for the past half century and whilst student dissertations and theses remain a constant within universities and places of learning, their significance has, in part, been superseded by the demand for blockbuster international exhibitions and coffee table monographs that need to be academically rigorous but also appeal to today’s cultural tourist. The underlying quest for ‘new knowledge’ is as great as ever and the academic community’s role in disseminating this information to the wider public remains fundamental but what would Pevsner have made of today’s museum bookstore?